We are happy to be today’s stop on the Seeds of Discovery Blog Tour hosted by Lightning Book Productions. Book Summary from Goodreads: Quinn Robbins’ life was everything she thought a teenager’s should be. She has good friends, a family that she loves, good grades, and an after-school job she enjoys. And, she’s just been asked out by Zander Cunningham, a popular football player and great guy. But one day when driving home after picking up her little sister from the baby-sitter’s, she nearly hits a boy who, after running blindly into the street, mysteriously disappears. On a whim one night she follows him and suddenly finds herself in a new world. One where William is a prince, literally, and she is treated like a princess. She also discovers that she is stuck; the gate back to her own world isn’t always open. My Thoughts: Quinn is a fun character. She is a bit reserved, yet quite curious. She doesn’t quite buy into the social scene at her local high school, but she is a typical teenager in many other ways. When I began reading the book, I had a hard time figuring out how the cover image fit the story at all. It opens in a modern small town and follows Quinn as she is torn between a budding crush on her long time good friend, and her curiosity about William. I couldn’t see how a castle fit in to the story. Then all of a sudden, a burst of courage and an overwhelming sense of curiosity sent Quinn on an adventure in a modern fairy tale world of Kings and Queens, Princes and Princesses. But this world, while beautiful and filled with wonderful people, is plagued by a mysterious illness that only seems to attack children, and rarely more than one child in the same family. I really enjoyed reading this book. It is fun and clean. The characters are very likable and I found myself wondering more about them. I liked that the story shed a positive light on larger families. As a mom to five children I love to see the positive aspects of large families highlighted (The king and queen in this tale have 13 children!). 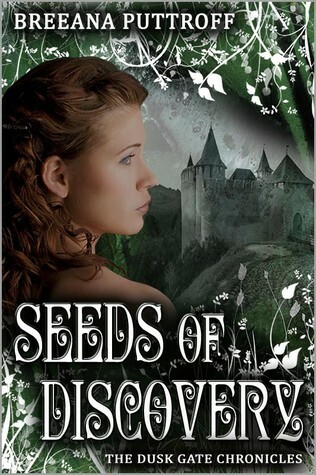 I would definitely recommended this book, especially if you like a light fantasy read. I look forward to reading the next books in the series! About the Author: Breeana Puttroff has loved making up stories since she could talk. For many years, her biggest audience for those stories was the fantastic students she had the privilege of teaching. One summer afternoon, while she was picnicking in the beautiful mountains of her Colorado home with her little girl, Breeana saw an old, broken stone bridge, and she just knew there was a story inside. Six months later, the Dusk Gate Chronicles was born. Breeana now runs a small business and writes full-time, and is a busy, single, homeschooling mom to her beautiful daughter.